1 How do human rights work? 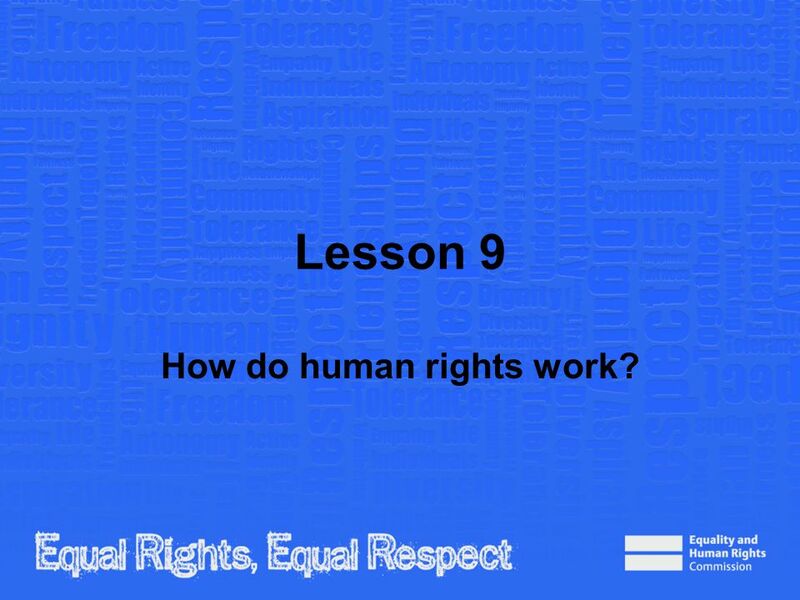 Lesson 9 How do human rights work? 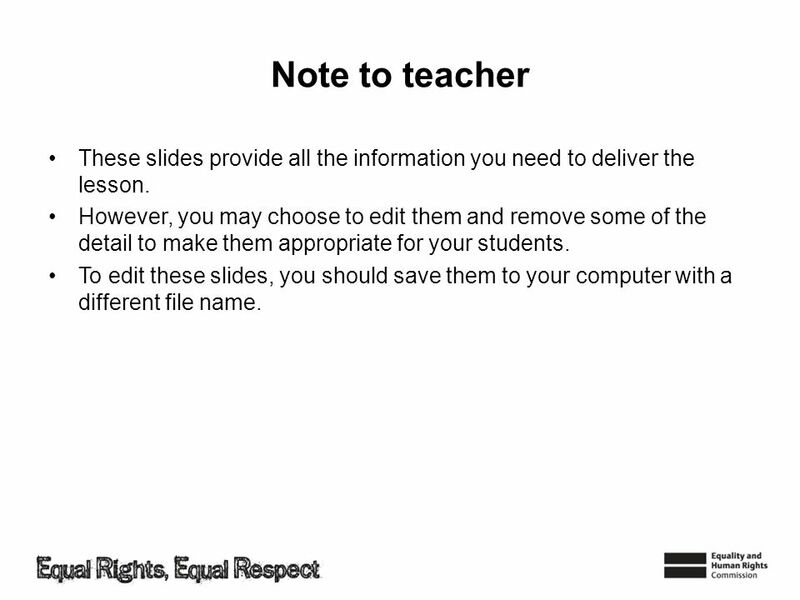 2 Note to teacher These slides provide all the information you need to deliver the lesson. However, you may choose to edit them and remove some of the detail to make them appropriate for your students. To edit these slides, you should save them to your computer with a different file name. 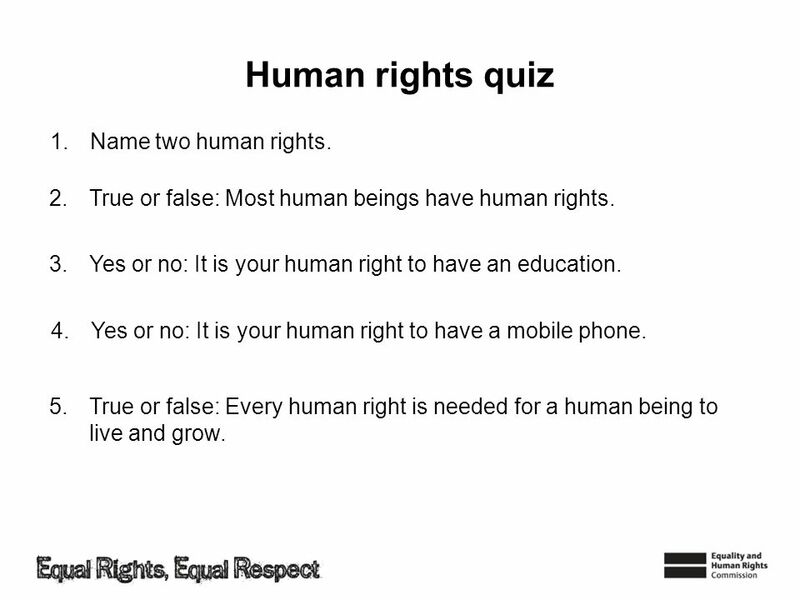 3 Human rights quiz Name two human rights. 2. True or false: Most human beings have human rights. 3. Yes or no: It is your human right to have an education. 4. Yes or no: It is your human right to have a mobile phone. 5. True or false: Every human right is needed for a human being to live and grow. 2. 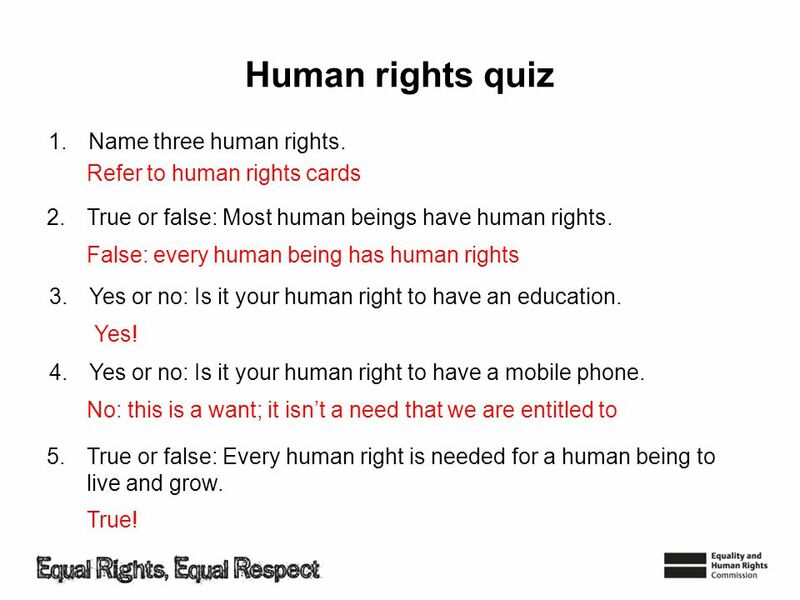 True or false: Most human beings have human rights. False: every human being has human rights 3. Yes or no: Is it your human right to have an education. Yes! 4. Yes or no: Is it your human right to have a mobile phone. No: this is a want; it isn’t a need that we are entitled to 5. True or false: Every human right is needed for a human being to live and grow. True! Understand where human rights came from. 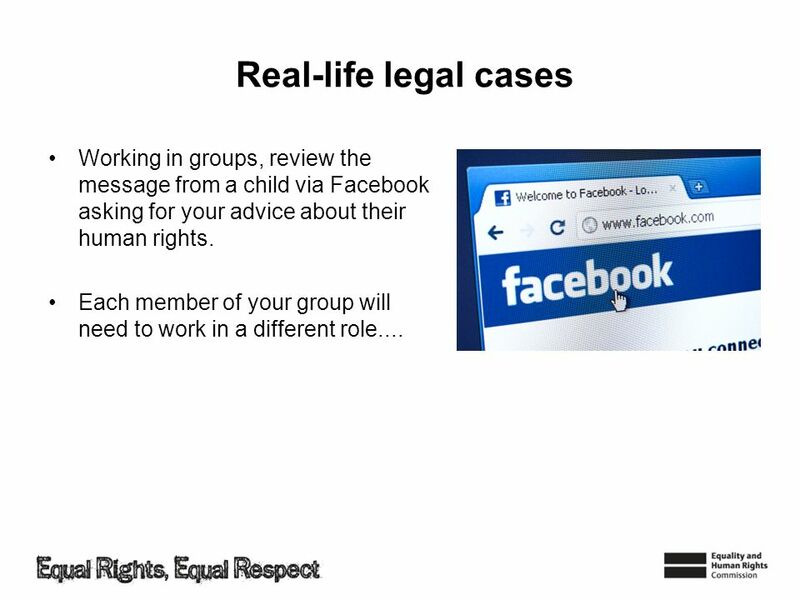 Be aware of the laws that help to protect young people’s human rights in the UK. 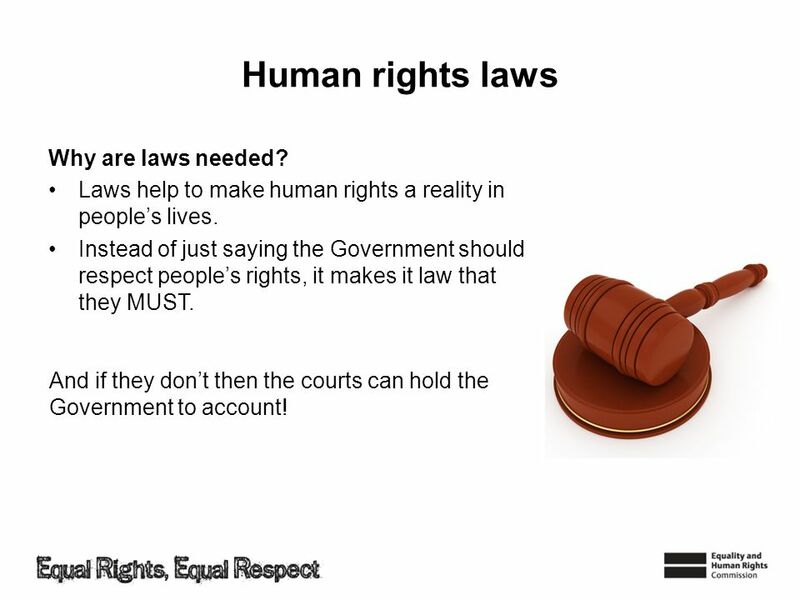 Understand how human rights work in practice. 6 The human rights story The ideas behind human rights can be traced far back in history. For example: c26-33AD: Jesus Christ preaches morality, tolerance, justice, forgiveness and love. : Prophet Mohammed teaches the principles of equality, justice and compassion revealed in the Qur’an. 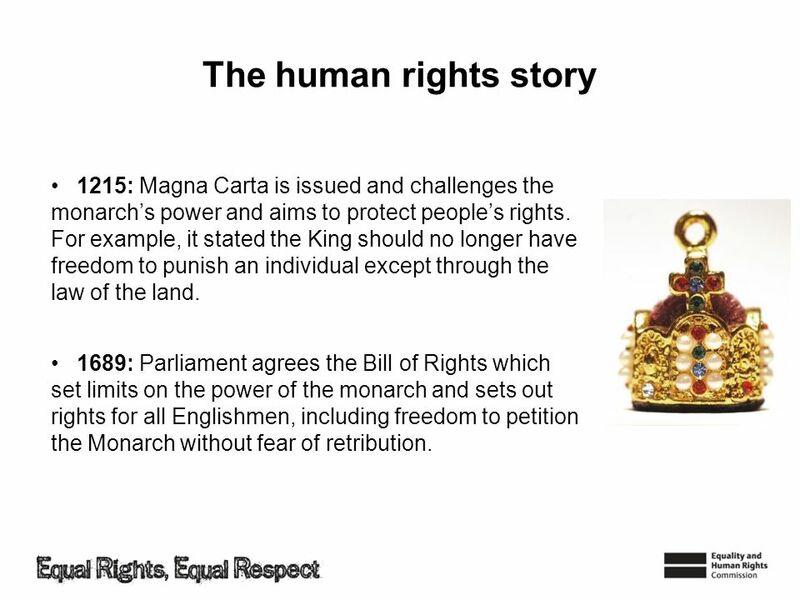 7 The human rights story 1215: Magna Carta is issued and challenges the monarch’s power and aims to protect people’s rights. For example, it stated the King should no longer have freedom to punish an individual except through the law of the land. 1689: Parliament agrees the Bill of Rights which set limits on the power of the monarch and sets out rights for all Englishmen, including freedom to petition the Monarch without fear of retribution. 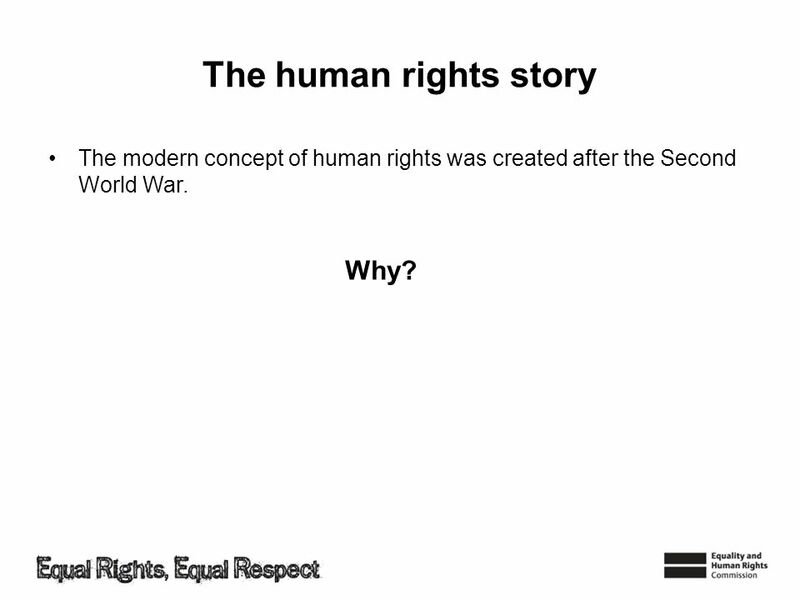 8 The human rights story Why? 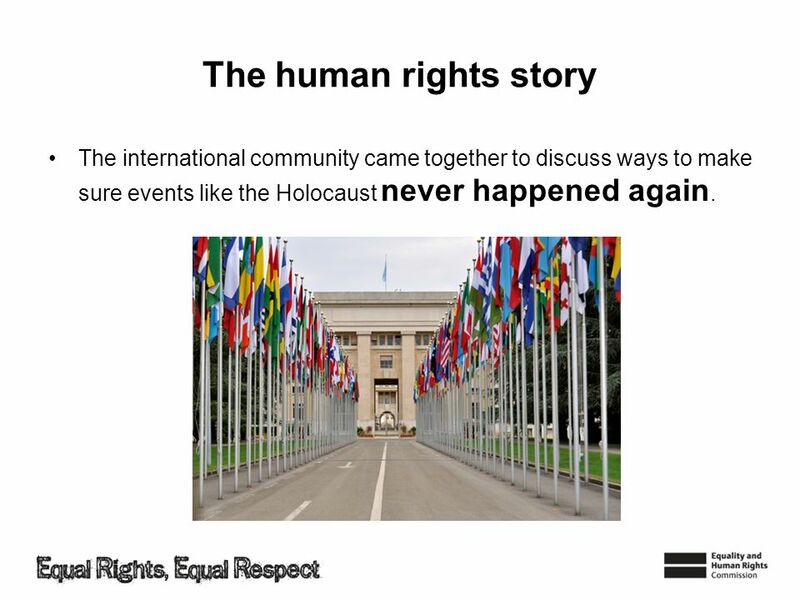 The modern concept of human rights was created after the Second World War. Why? 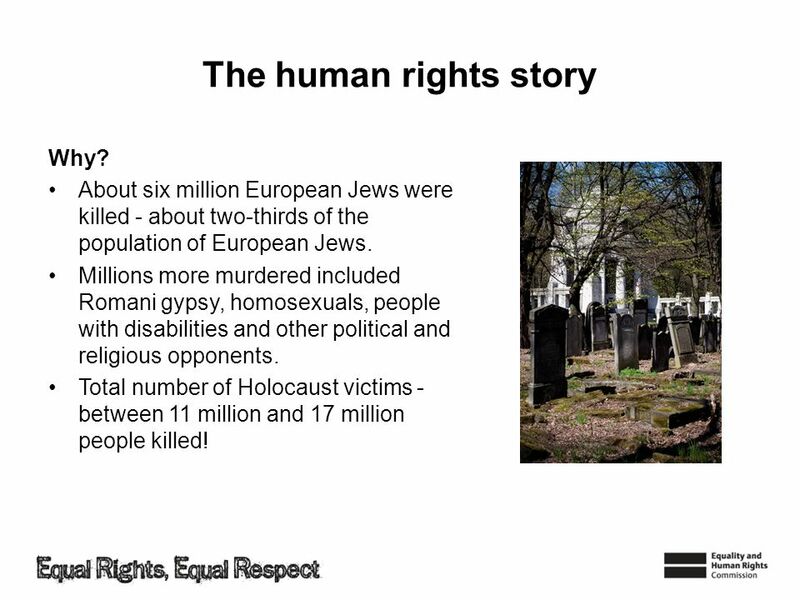 9 The human rights story Why? About six million European Jews were killed - about two-thirds of the population of European Jews. Millions more murdered included Romani gypsy, homosexuals, people with disabilities and other political and religious opponents. Total number of Holocaust victims - between 11 million and 17 million people killed! 10 Is this right or fair? 11 The human rights story The international community came together to discuss ways to make sure events like the Holocaust never happened again. 12 So, what did they do? The United Nations put together the Universal Declaration of Human Rights (UDHR). It includes 30 rights that every human needs to grow and flourish. 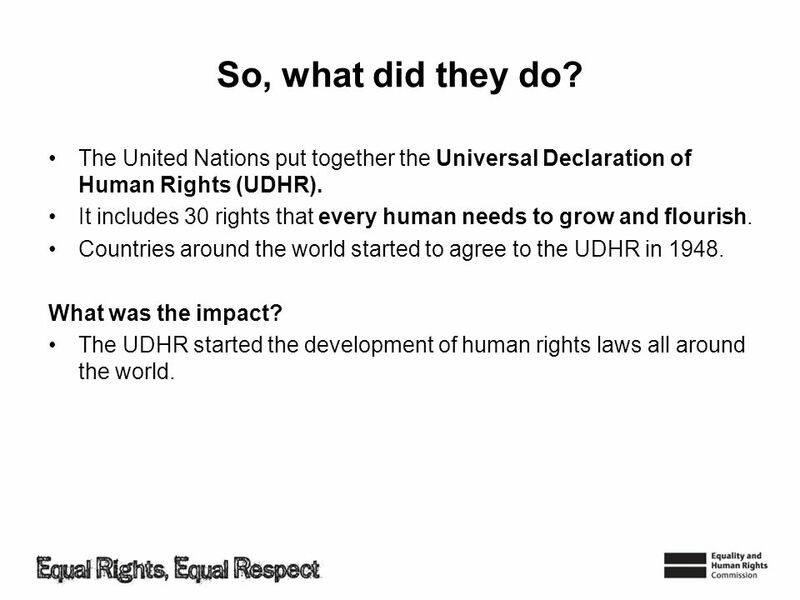 Countries around the world started to agree to the UDHR in 1948. What was the impact? The UDHR started the development of human rights laws all around the world. 13 Why do we need laws? More or less people would steal? 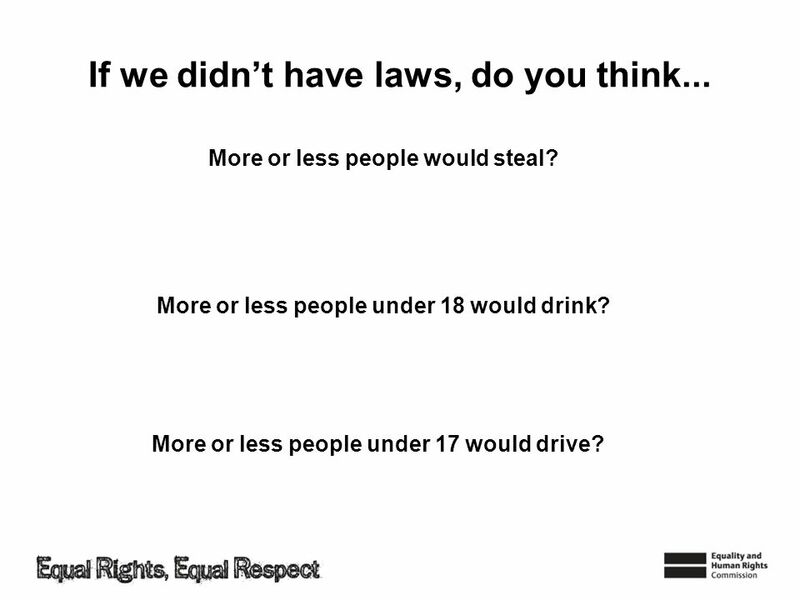 More or less people under 18 would drink? More or less people under 17 would drive? 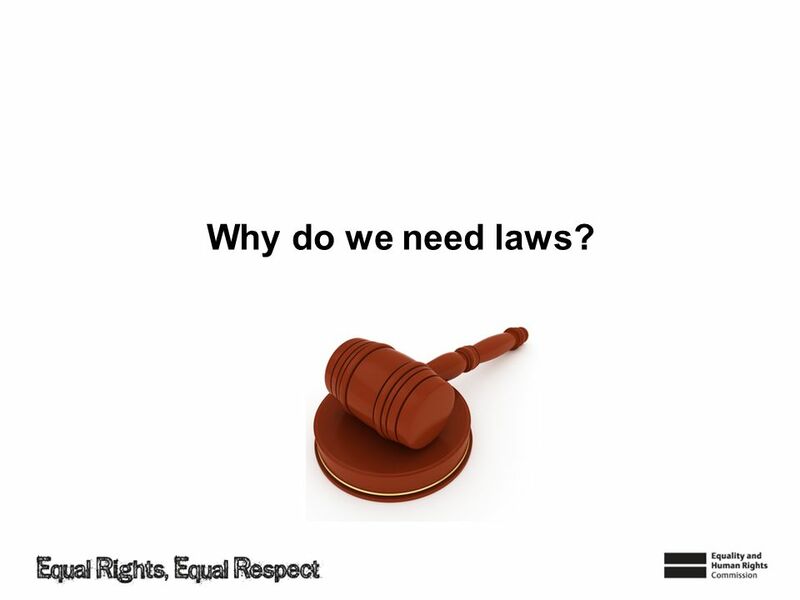 15 Human rights laws Why are laws needed? Laws help to make human rights a reality in people’s lives. Instead of just saying the Government should respect people’s rights, it makes it law that they MUST. And if they don’t then the courts can hold the Government to account! 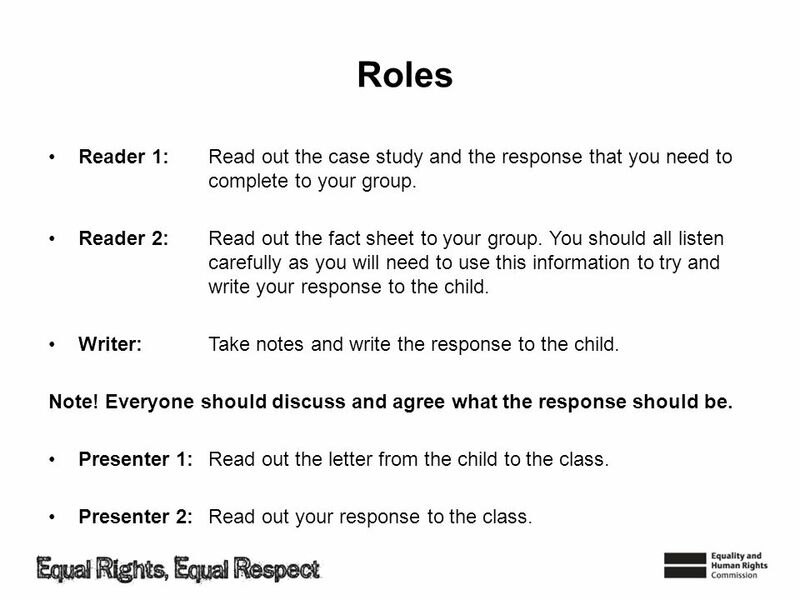 17 Roles Reader 1: Read out the case study and the response that you need to complete to your group. Reader 2: Read out the fact sheet to your group. You should all listen carefully as you will need to use this information to try and write your response to the child. Writer: Take notes and write the response to the child. Note! Everyone should discuss and agree what the response should be. Presenter 1: Read out the letter from the child to the class. Presenter 2: Read out your response to the class. The right to play, rest and leisure. The right to express his or her views and have them taken into account on all matters that affect them. Explain which human rights law or laws can help to protect their rights: United Nations Convention on the Rights of the Child. 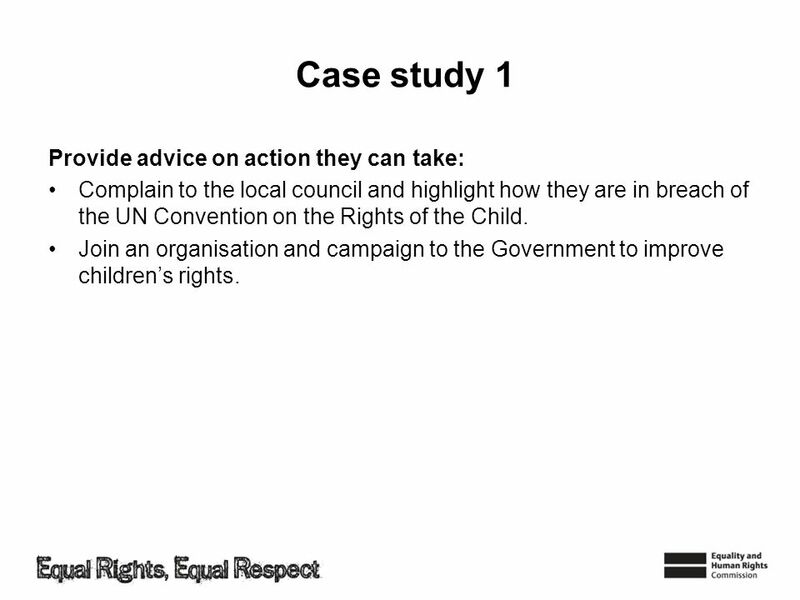 Complain to the local council and highlight how they are in breach of the UN Convention on the Rights of the Child. Join an organisation and campaign to the Government to improve children’s rights. 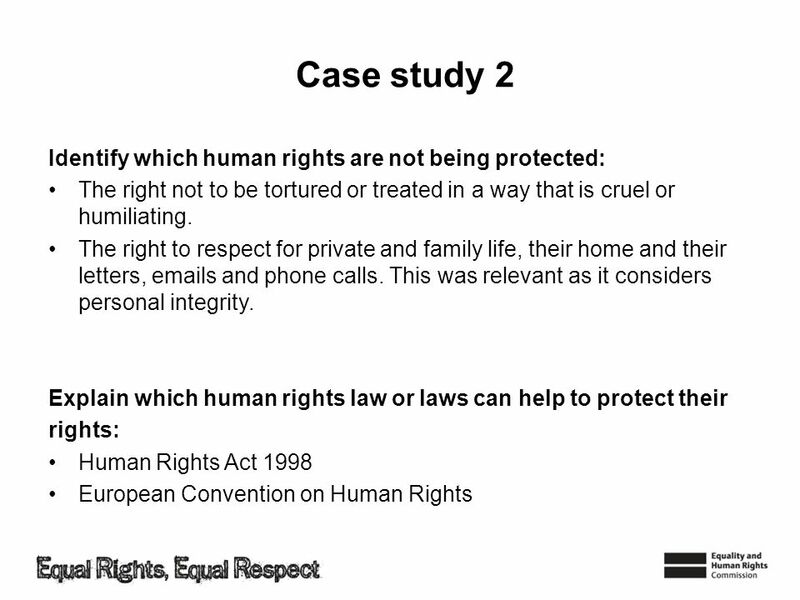 20 Case study 1 – real-life Every five years the Government has to submit a report to the United Nations stating what they are doing to protect children’s rights . 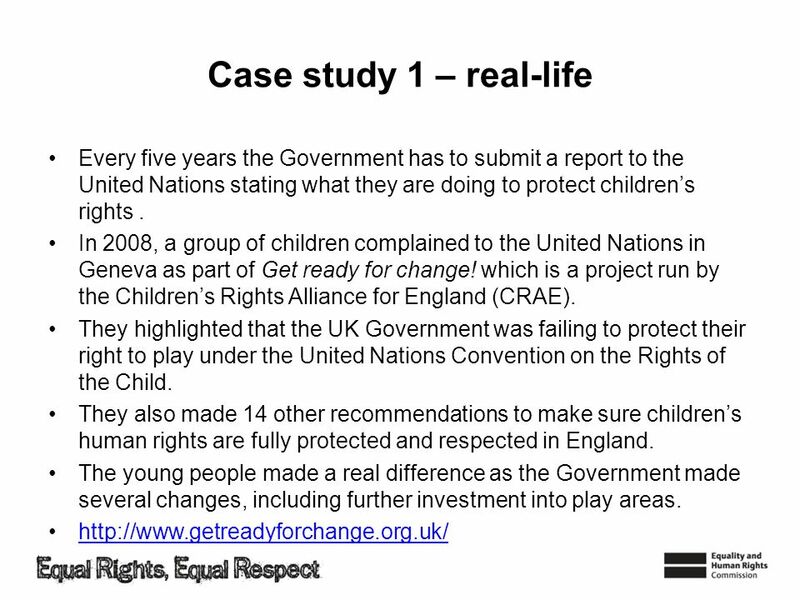 In 2008, a group of children complained to the United Nations in Geneva as part of Get ready for change! which is a project run by the Children’s Rights Alliance for England (CRAE). 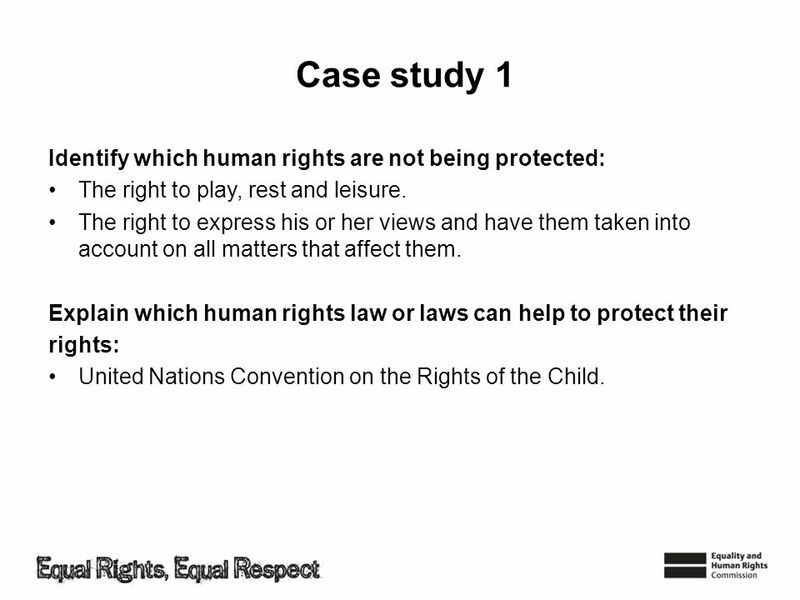 They highlighted that the UK Government was failing to protect their right to play under the United Nations Convention on the Rights of the Child. They also made 14 other recommendations to make sure children’s human rights are fully protected and respected in England. The young people made a real difference as the Government made several changes, including further investment into play areas. They could complain to the Secure Training Centre. If this complaint was not taken seriously, they could take their case to a UK court. If the case failed through the UK courts, they could try to take their case to the European Court but this is rare and can be expensive. 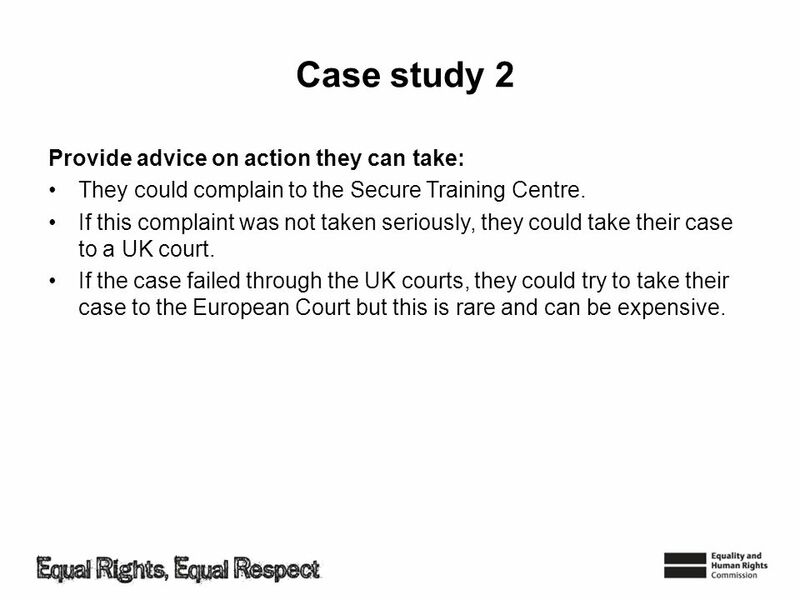 23 Case study 2 – real-life In July 2008, the UK Court of Appeal protects the human rights of children in Secure Training Centres by overturning new restraint rules. The rules were rushed in following the death of a child following restraint. Instead of increasing child protection in Secure Training Centres, Ministers had given staff extra restraint powers. The UK Court of Appeal found that the new rules breached the following human rights: The right not to be tortured or treated in a way that is cruel or humiliating. 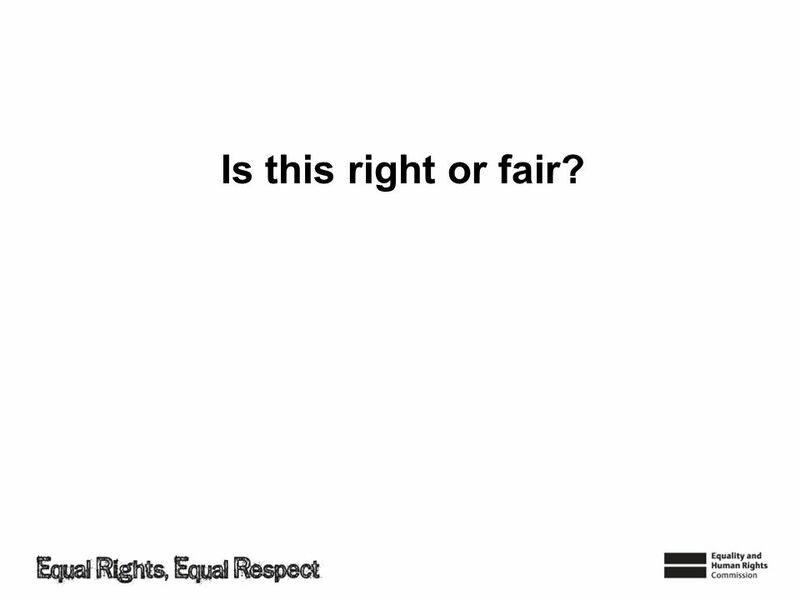 The right to respect for private and family life, their home and their letters, s and phone calls. 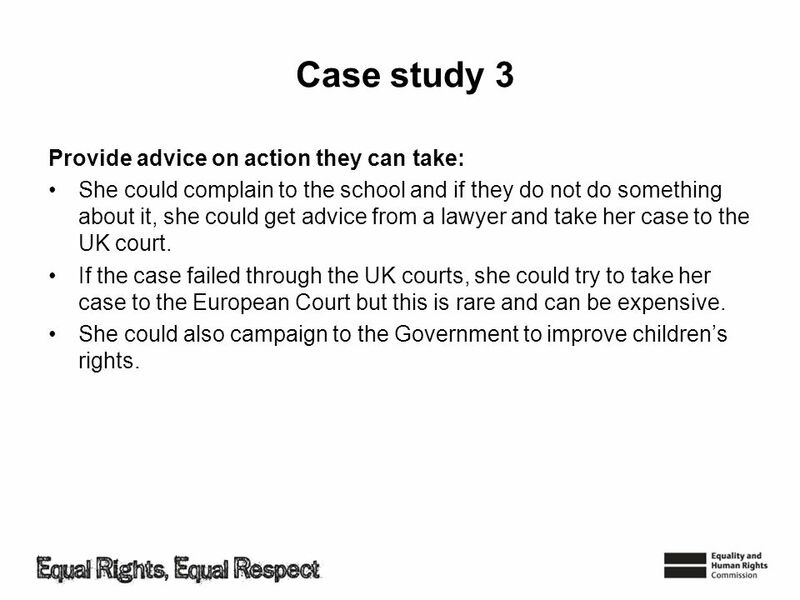 She could complain to the school and if they do not do something about it, she could get advice from a lawyer and take her case to the UK court. If the case failed through the UK courts, she could try to take her case to the European Court but this is rare and can be expensive. She could also campaign to the Government to improve children’s rights. 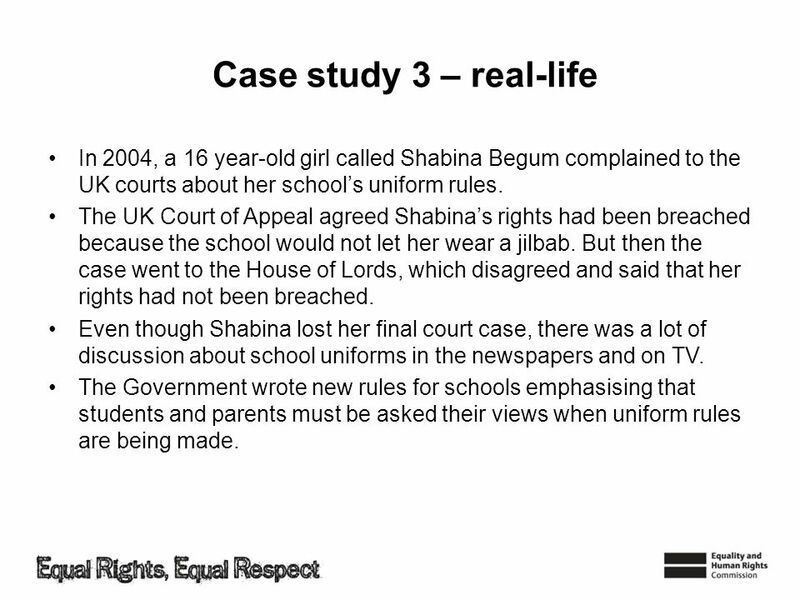 26 Case study 3 – real-life In 2004, a 16 year-old girl called Shabina Begum complained to the UK courts about her school’s uniform rules. The UK Court of Appeal agreed Shabina’s rights had been breached because the school would not let her wear a jilbab. But then the case went to the House of Lords, which disagreed and said that her rights had not been breached. Even though Shabina lost her final court case, there was a lot of discussion about school uniforms in the newspapers and on TV. The Government wrote new rules for schools emphasising that students and parents must be asked their views when uniform rules are being made. 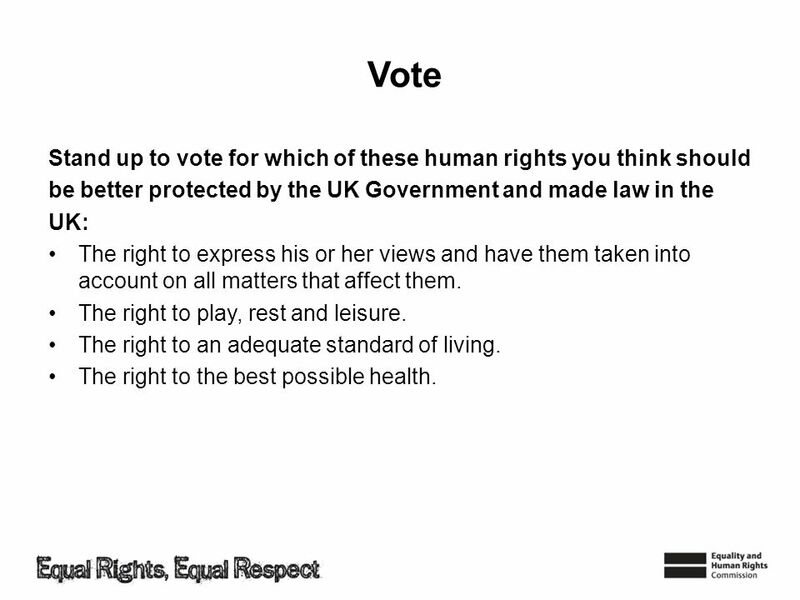 27 Children’s rights When the Government makes human rights part of UK law, it is saying that they think it is so important, we should be able to protect it through our UK courts. 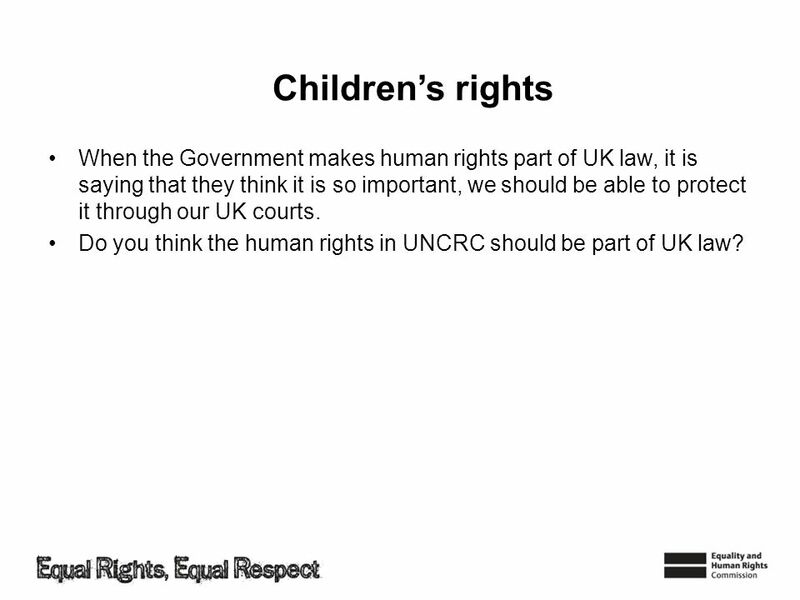 Do you think the human rights in UNCRC should be part of UK law? 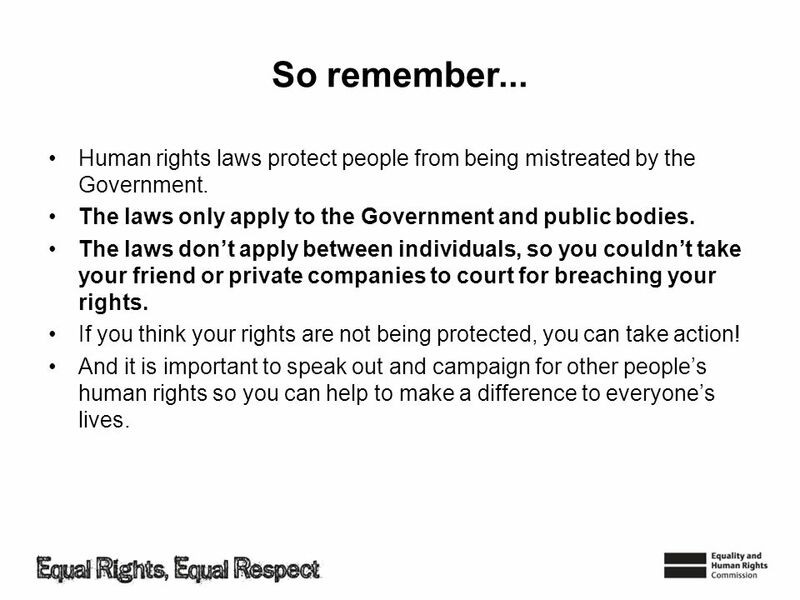 be better protected by the UK Government and made law in the UK: The right to express his or her views and have them taken into account on all matters that affect them. The right to play, rest and leisure. The right to an adequate standard of living. The right to the best possible health. 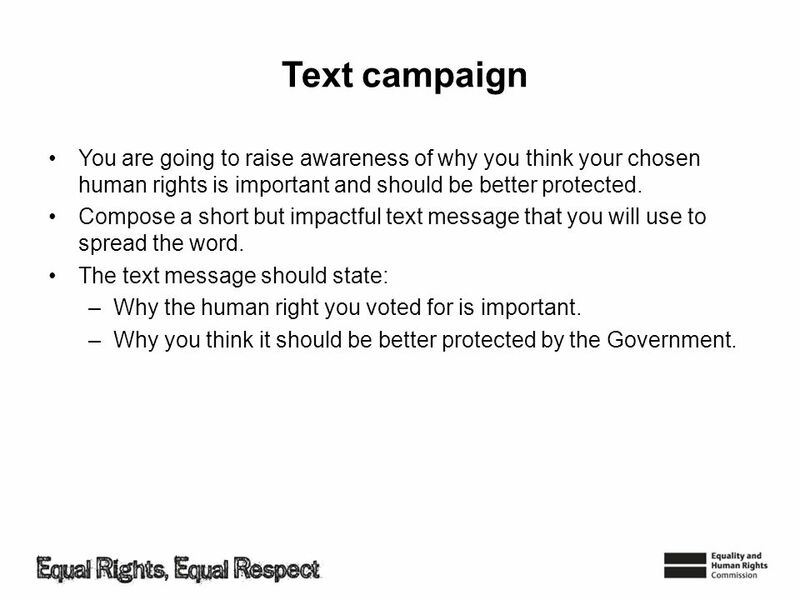 29 Text campaign You are going to raise awareness of why you think your chosen human rights is important and should be better protected. Compose a short but impactful text message that you will use to spread the word. The text message should state: Why the human right you voted for is important. Why you think it should be better protected by the Government. 30 So remember... Human rights laws protect people from being mistreated by the Government. The laws only apply to the Government and public bodies. The laws don’t apply between individuals, so you couldn’t take your friend or private companies to court for breaching your rights. 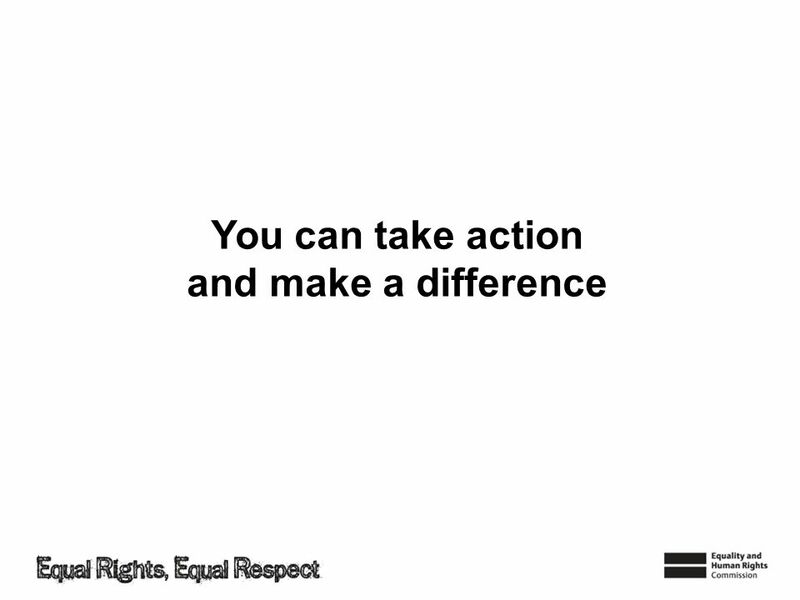 If you think your rights are not being protected, you can take action! And it is important to speak out and campaign for other people’s human rights so you can help to make a difference to everyone’s lives. 32 What have we learnt? 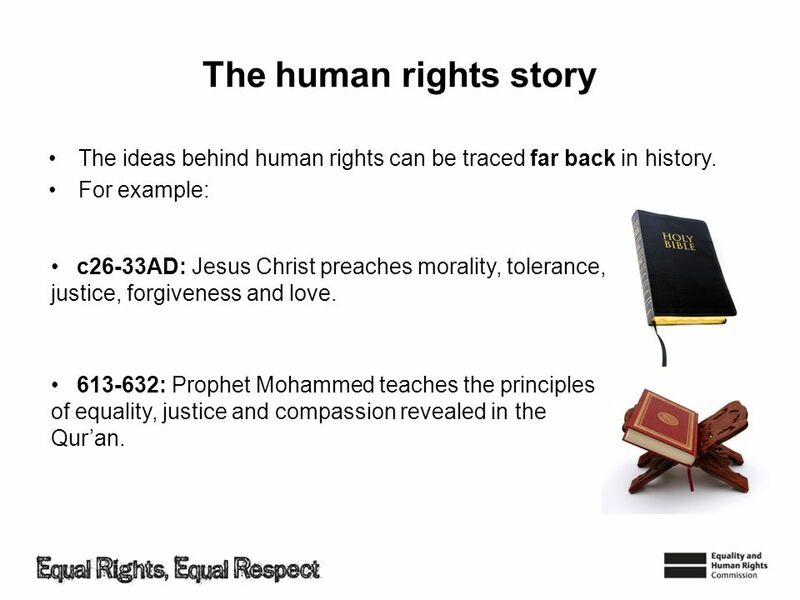 Where human rights came from. 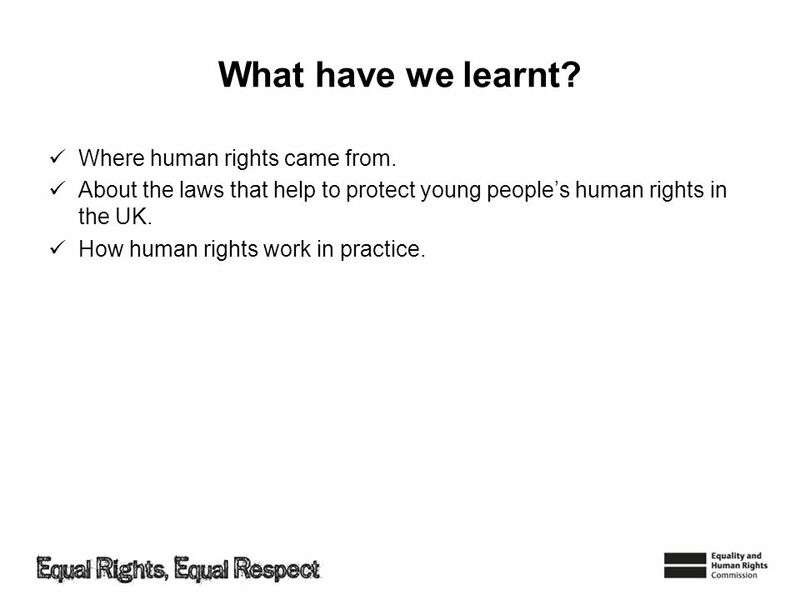 About the laws that help to protect young people’s human rights in the UK. How human rights work in practice. 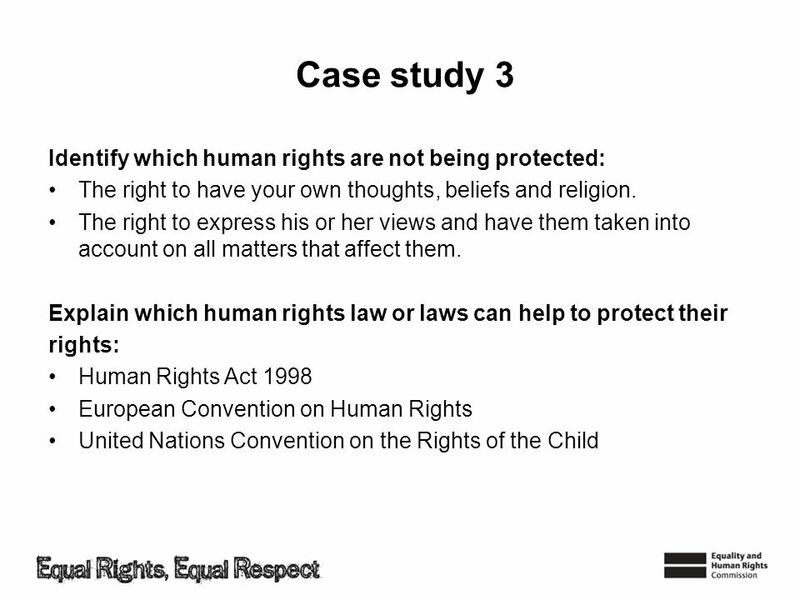 Download ppt "How do human rights work?" The United Nations & The Universal Declaration of Human Rights. Delivery notes In the notes section at the bottom of these slides there are some additional notes to aid delivery. You can view these in full by going. 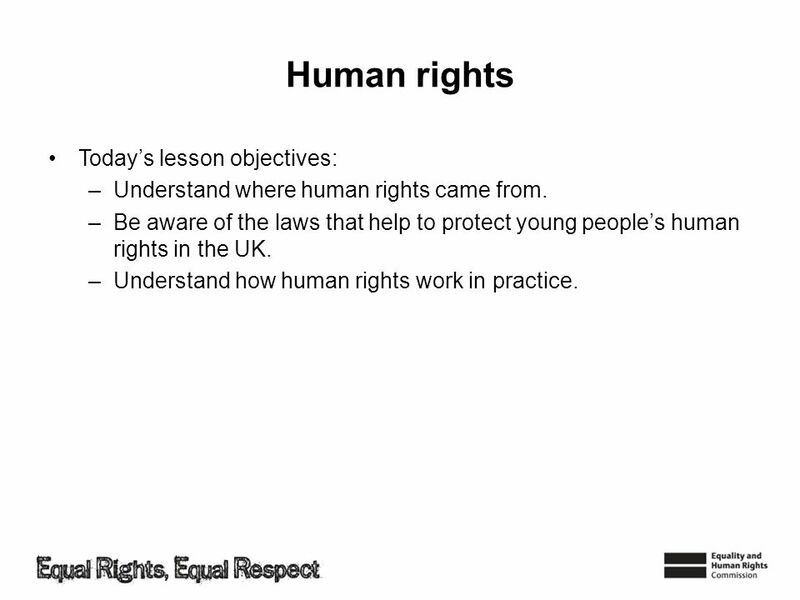 Lesson 8 What are human rights?. The Constitution A brief History How did our Constitution develop? In 1689 King William of Orange (Holland) and Queen Mary were invited by parliament. Children’s Rights Rebecca K. Fraker NAD Teacher Bulletin Volume 13. Name RMPS Mrs McGuinness Rm 135 Tue p3 4.1.